One in four US adults, aged 65 or over, suffers a fall each year. And unfortunately, according to the Centers for Disease Control and Prevention, falls are the leading cause of fatal injuries in older Americans. Learning how to use a walking cane can help prevent falls and resulting injuries by improving balance and stability while walking. It can also help those who have suffered an injury or have a disability that makes walking difficult. A 2015 study estimated that almost 5.8 million US adults, 65 and older, use a walking cane. Although canes can be helpful, choosing the right one is not as straightforward a task as it might sound. 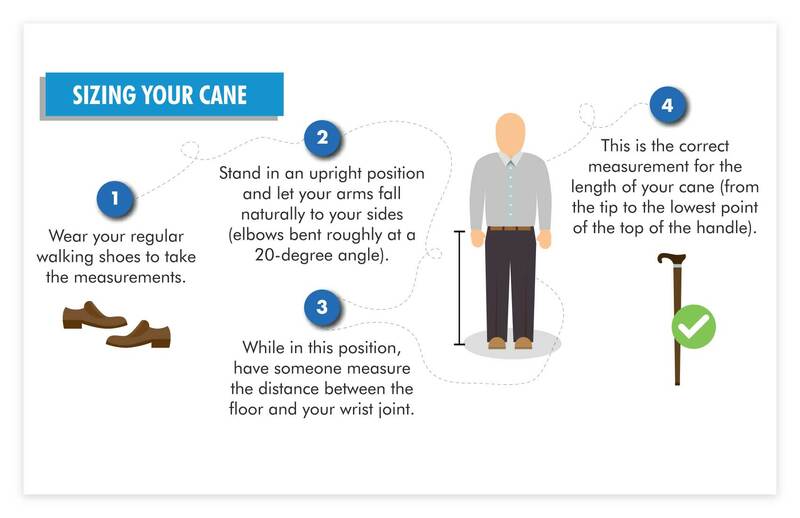 From finding the right type of cane to ensuring you have the proper cane height, there are multiple factors to consider. What’s more, once you find the right one, it’s important that it is used correctly in order to ensure safe walking. You should consult a physician or physical therapist while deciding which cane is right for you, but it’s helpful to know what’s available. In this article, we will guide you through how to choose a cane and how to use it correctly. Let’s get started! Consult a physician to understand which type of cane is best for your needs. Decide on the type of cane and the type of grip that will suit you. Choose a cane that is durable and has a lot of good reviews from others. 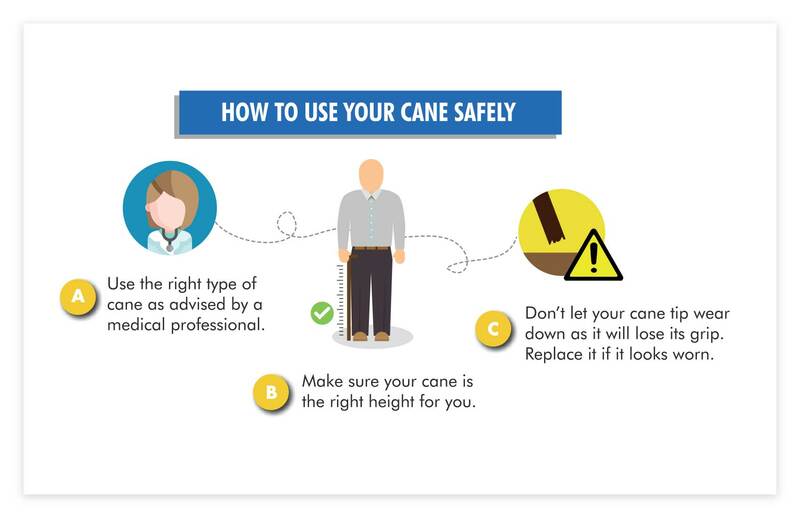 Size your cane so that it’s comfortable and doesn’t risk causing additional injury. 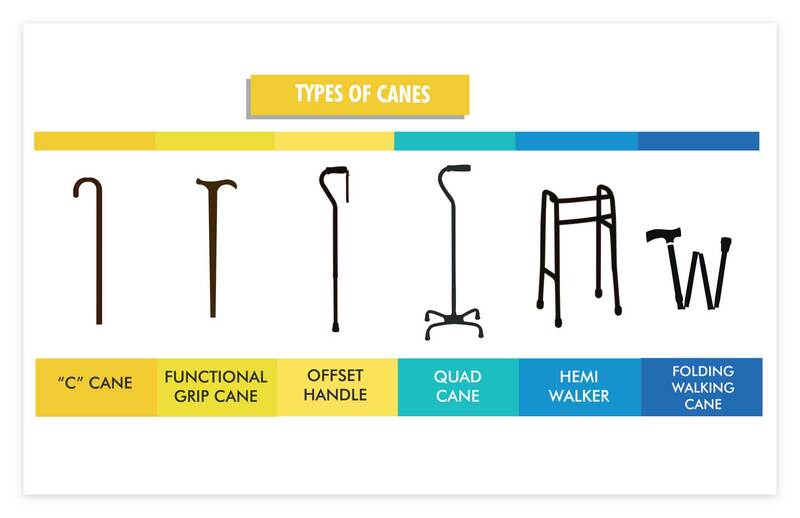 With so many canes on the market, it can be confusing to decipher what each one is for. Below we list and describe some common types of canes. Bear in mind that some of these may be combined. For example, many quad canes have a functional grip and are foldable. Features: This is one of the most basic types of walking cane. It is a single-tip straight cane with a curved (C-shaped) handle. It helps balance simply by increasing your base of support. People using these canes should need only minor assistance with balancing or keeping weight off one lege. Features: This is the type of cane that probably springs to mind for most people. It is a straight single-tip cane with a straight handle (perpendicular to the main shaft). The straight handle allows for better grip and control than a curved one does. This type of cane is ideal for people who need a bit more assistance with balance. Features: The design of this walking cane ensures the user’s weight is centered such that it bears mainly on the strongest part of the cane. The improved weight distribution results in more stability. It is suitable for those who need to put partial weight on their cane. Features: Rather than a single tip, this has four supports at the bottom, forming a rectangular base of varying size. It typically comes with an offset handle and is suitable for those requiring a lot of support. It can bear more weight than a single tip cane and reduces the chances of slipping. It can stand alone instead of having to be leaned against something when not in use. Features: As the name suggests, this type of cane is closer to a walker than the others. It has an even larger base than a quad cane and is often used by those transitioning to or from a walker. Features: A folding cane is a regular cane — usually a functional grip cane — that can be folded. When folded, it might be carried by a wrist strap or placed in a bag. One of the most important steps to take before using a cane is to ensure it’s the rights size. If a cane is too long, it will be more difficult to pick it up to move it while you walk. A too short cane could cause the user to lean to the side, and can actually worsen balance. Always consult your physical therapist or doctor to make sure that your cane is right for your specific condition. Hold the walking cane in the opposite hand to the affected or weakest leg. The cane should be at the same level as the hip bone on the upper thigh. The elbow should be bent at roughly a 20-degree angle when the hand is resting on the cane. Wear your regular walking shoes to take the measurements. Stand in an upright position and let your arms fall naturally to your sides (elbows bent roughly at a 20-degree angle). While in this position, have someone measure the distance between the floor and your wrist joint. This is the correct measurement for the length of your cane (from the tip to the lowest point of the top of the handle). Adjustable height: Purchasing an adjustable cane means you can ensure you always have the right fit. Plus you don’t have to deal with cutting a cane to the right size. Good grip handle: This is often a matter of preference, but the right grip can reduce joint stress and prevent joint deformities. Grips come in different shapes and materials, and your physician or physical therapist can help you decide which one to go for. Quality material: You need to know that your cane is going to be reliable and last a long a time. Choosing a durable material will reduce the risk of being without a cane and will mean having to replace it less often. Additional features: Depending on your individual situation, you might need a cane that has some unique features. For example, some canes provide an additional handle to help with getting up from a sitting position. Others actually include a seat in their design in case you need to take regular breaks. We covered some of the most common types of canes above, but here we’ll look at a top-rated example of each. Use the right type of cane as advised by a medical professional. Make sure your cane is the right height for you. Don’t let your cane tip wear down as it will lose its grip. Replace it if it looks worn. Hold the cane in your hand on your unaffected side so that it provides support to the opposite lower limb. Advance the cane simultaneously with the affected leg. Keep the cane in place when you step forward with the unaffected leg. Lean your weight through the arm holding the cane as needed. Always have the unaffected lower limb assume the first full weight-bearing step on level surfaces. Hold onto the railing with your free hand if possible. To go upstairs, if you have a leg injury or disability, step up with the stronger leg first. Then move the cane as you step up with the affected leg. To go downstairs, move your cane to the lower step first, followed by your affected leg. Finally, move your unaffected leg. 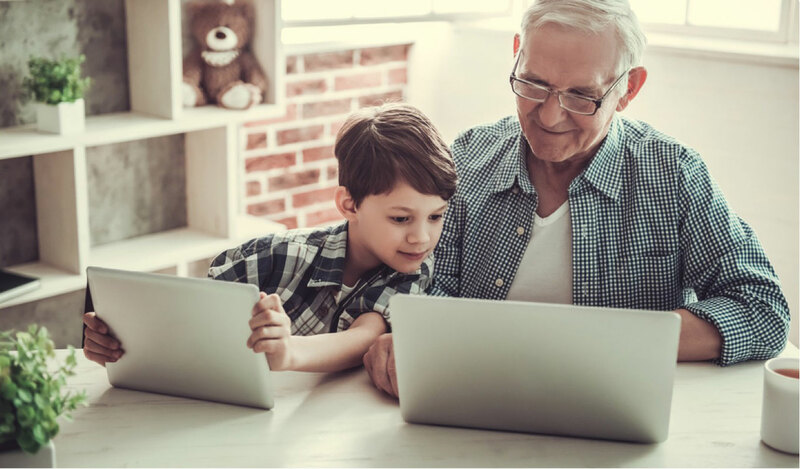 A 2015 study of cane and walker users found that nonuse of their device resulted in a higher number of falls as compared to those using their device. Moreover, a significantly higher proportion of falls resulted in surgery for those not using their device at the time of the fall. A major take home from this is that users should be utilizing their device more often than they currently are. With so many options out there, choosing a cane can be a difficult task, often a case of trial and error. Now that you’re armed with all this information about how to choose a cane and use it safely, you’ll be able to make an educated decision. For some people looking for mobility assistance around the home, there are also other options to consider. For example, if stairs are a primary concern, then perhaps looking into having a stairlift installed in the home might be a good idea. No doubt the tips we’ve provided in this post will help you or your loved one feel more informed and prepared when it comes to choosing and using a walking cane. We’d also like to hear any advice you have that might help other readers. Do you have any tips for choosing a cane or using it safely? Let us know in the comments section below!